COMMENTARY — Utah played its annual Red-White game last Saturday. To call it inconsequential would be a huge understatement. While we learned a little about some individual players, we learned next to nothing about the team as a whole. Coming off of a surprising 9-4 season, expectations have been ratcheted back up again for the Utes. There is already talk of Devontae Booker being a legitimate Heisman candidate. The season-opener at home against Michigan on Sept. 3 will be an excellent indication of how good this team is going to be, but until then we’re just throwing darts in the dark as we speculate about what might be. Saturday’s game featured a lot of back-ups — and I mean a lot! Many projected starters on both sides of the ball watched from the sidelines. Booker was basically covered in bubble wrap on the bench. Accordingly, Saturday’s scrimmage provided precious little (if any) insight into what to expect come fall. I’m not worried about the defense one bit. Even with a new defensive coordinator in John Pease, once again I fully expect the defense to be tough as nails and keep Utah in every game with a chance to win. I have a lot more concern about the Utes’ offense. The two biggest question marks about the offense are coaching and the quarterback. It should come as no surprise that the two are inextricably intertwined. Let’s start with coaching. It is simply impossible to put a positive spin on eight offensive coordinators in eight years. That’s a problem, it has been a problem for quite some time and it appears to be a problem that is not going away anytime soon. I liked Brian Johnson, but had reservations when he was elevated to offensive coordinator. Similarly, I like Aaron Roderick and Jim Harding, but I’m just not convinced that they are the answer right now, especially as co-offensive coordinators. It’s bad enough to try and play the quarterback position by committee, but do we have to do so from a coaching standpoint as well? Who will ultimately provide much needed guidance and direction? Who will ultimately take responsibility? We’ll just have to wait and see. Now let’s talk about quarterbacks. 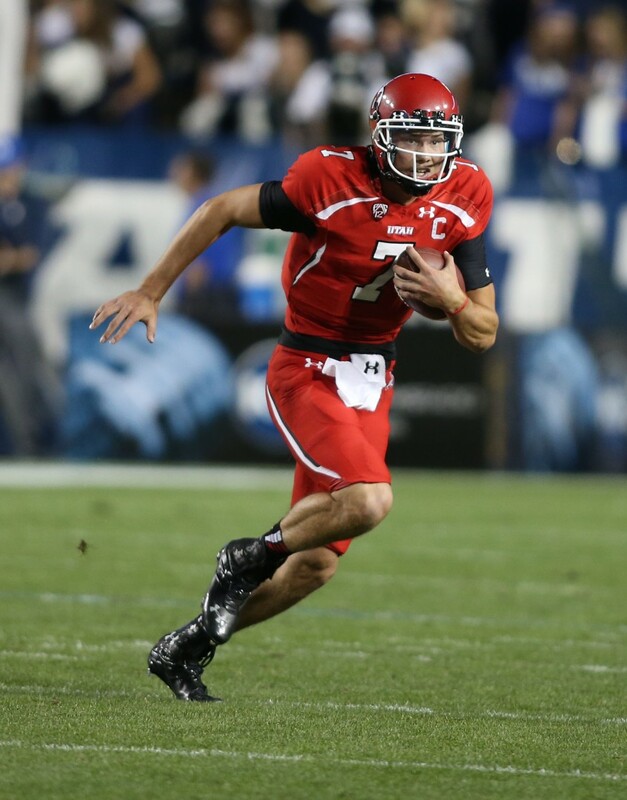 Travis Wilson is entering his senior year, having started since he was a freshman. The fact that there is any question whatsoever as to whether or not he will be the definitive starter next year in and of itself is a huge red flag. A senior who has started since his freshman year should be such a stud that there is no question he is the man. That’s not the case, and that’s a problem. In Wilson’s defense, he has had to deal with a new offensive coordinator, and essentially a new system and scheme each year, not to mention multiple quarterbacks coaches and, once again, that’s a problem. Similar to the lack of continuity that Alex Smith experienced in San Francisco in his early years in the NFL, it is really hard to play well when you are basically starting from scratch each season with precious little stability and carryover from year to year. Throughout much of last year, there was an open competition in practice each week to see who the starting quarterback would be for the game that weekend. It appears that we are headed for a similar scenario this year. Clearly, once again, that’s a problem. Utah head coach Kyle Whittingham has already made it clear that Kendal Thompson (who had supplanted Wilson as the starter before a season-ending injury against Oregon) will have an opportunity to compete for the starting job in fall camp. We may also see a deliberate quarterback-by-committee approach using both Wilson and Thompson. And the quarterback controversy extends beyond just the starting slot. Six scholarship quarterbacks are vying for position on the depth chart, with four of them eyeing an opportunity to start in years to come. Based on reps in spring ball, and especially comments made by Whittingham, it appears that Chase Hansen, recently returned home from his LDS mission, is at the head of the pack. That would leave sophomores Connor Manning and Brandon Cox and redshirt freshman Donovan Isom out in the cold. Manning and Isom were the only quarterbacks to even see the field in the Red-White game. Last year, Cox outplayed everyone (including Wilson, in my humble opinion), but this year he didn’t take a single snap. Why? During the Las Vegas Bowl rout of Colorado State, it would have been very easy to put in one, or even two, young quarterbacks as an audition for future years. Instead, the only quarterbacks to play besides Wilson were Adam Schulz and Jason Thompson, neither of which had any realistic chance of being Utah’s future starting quarterback. Why didn’t Manning or Cox get a chance? Two years ago when Wilson went down with a season-ending (and potentially career-ending) head injury, the Utes limped through the remainder of the season with the gutsy, but sadly ineffective, Schulz behind center. What might have happened if the redshirt had been pulled off of Manning or Cox? We’ll never know. Will one or more quarterbacks transfer in an effort to find playing time for another team? If so, will those transfers occur prior to fall camp, or after next season plays out? We don’t know. And that’s the takeaway from spring ball as we await the start of fall camp — when it comes to the quarterback position we simply don’t know much. Here’s hoping the Utes can stay the course on defense, right the ship on the offensive side of the ball and produce another fan-pleasing performance in the season to come.